I’m a college graduate, but some people still talk to me as if I were a child. 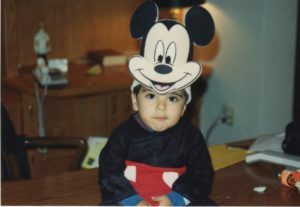 In case you were wondering, this is what I looked like as a child. No Snapchat filter needed. This doesn’t mean that people look at me and instantly create a mental Snapchat filter that puts a pacifier in my mouth. It’s often more subtle than that. For example, there have been many times I’ve been out at a restaurant with friends my age, ready to give my order, only to be skipped over by the server who turns to another person and asks them what I’d like to eat. Hello? I’m right here! The expectation seems to be that I can’t answer for myself. When I speak up and say what I’d like for my meal – and add “And I’ll have an extra dirty martini (shaken, not stirred)” – the server’s face typically goes from ghost white to beet red all in a matter of seconds. I can and do order my own drinks. This experience is all too common for adults in the physically disabled community. Being overlooked is frustrating, but being talked down to – especially by my peers, people younger than me or the people who work for me as caregivers – bothers me even more. I don’t expect to be called Sir or Mr. Akmakjian – in fact I hate it. But there are other ways to demonstrate respect. Here’s one way not to do it: Once, as I prepared for a trip and was finishing packing, the book I was planning to read on the plane didn’t fit in my carry-on. I suggested I would just hold the book throughout the journey. Rather than agreeing with me and moving on, a relatively new caregiver said: “Well, if you want to hold your book, you have to hold it the whole way there. Are you sure you want to do that?” It felt like he was a parent telling their kid to use the bathroom before leaving the house or hold it until the minivan stops. I was furious and considered canceling the trip and relieving him of his duties right then. Thankfully, I kept my cool and this was a one-time faux pas – with that guy. Another thing that happens far too frequently is that people seem to think it’s hilarious to give me juvenile nicknames, most of which have something to do with my wheelchair. Think Speedy Gonzales, Hot Rod and Speed Racer. Yes, they are accurate insofar as they describe how I drive my chair. But they’re also all references to children’s cartoons or toys. They don’t represent who I am – I have never liked cartoons and I am not a “car guy” – and they aren’t particularly original. 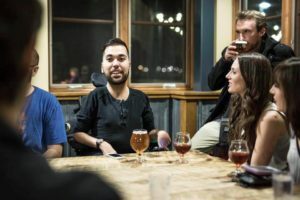 Make eye contact: This is common courtesy when it comes to the art of conversation, and this doesn’t change when speaking to someone who is disabled. Well, you might ask, if that’s the case, is it OK to crouch down to chair-height when speaking to someone who uses a wheelchair? I personally believe this is perfectly acceptable, as long as you talk to me like an adult. But I don’t want to speak for everyone. 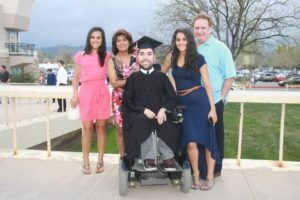 My wheelchair rises up and down, so I often find that people don’t kneel to my level. But it’s never bothered me much when they do. In fact, it’s a lot easier than craning my neck to look up at them. Also, for me, this is THE BEST way to give me a hug. I prefer hugs like this so I don’t have to say goodbye to your naval rather than you. Shake our hands: I understand that not everyone is capable of giving or receiving a standard handshake, myself included. But, for me, I appreciate when someone reaches for one when meeting me – even if I can’t reach back. Just give it a try. But also understand that you’ll have to do most, if not all, of the work. My hand might slip out of your grip, not extend fully across to meet yours or not open because it’s too cold. If it ends up that you simply rest your hand on mine for a moment, that’s OK, too. Ask questions: If you are someone who hasn’t had much experience interacting with disabled people, you may think it is rude to ask questions of us. In fact, most of us understand that you might not know much about our diseases, abilities/disabilities or needs. I love being asked about my SMA. It means you care enough and you want to learn. But I am more than my SMA or my wheelchair. You can and should ask me the same questions you would of anyone new you meet: where I’m from, what I do, what my interests are and what I’m up to this weekend. Now that I have all this off my chest, there’s one more thing I need to make clear. I’m a practical man; therefore, I hate apologies. They don’t fix anything for me. I’m of the view that actions speak louder than words. If you find that you have committed one or more of these gauche transgressions, don’t worry. You’re not alone. You shouldn’t feel bad. I think most people mean well and if they are guilty of anything it’s that they haven’t spent enough time with people like me. So I’m not looking for a heartfelt apology letter stained with the tears of your remorse. All I ask is that you try, with all of your might, to stop talking to me and other disabled people like kids.